PRIME MINISTER Narendra Modi is the only leader who can ensure the security of the nation and no leader from the opposition’s Mahagathbandhan can do that, BJP president Amit Shah said at a Vijay Sankalp rally in Agra on Sunday — his first since the announcement of the election schedule. He accused Congress president Rahul Gandhi of playing with national security and insulting the valour of the armed forces by questioning the Balakot airstrike for vote-bank politics. He said Gandhi “should be ashamed” for “questioning the airstrikes” and added that his statements “send a wave of happiness in Pakistan’s Parliament”. The BJP chief asked his Congress counterpart to not play with national security. He also lashed out at SP leader Ram Gopal Yadav and Congress leader Sam Pitroda for their comments on the terrorist attack in Pulwama and the airtstrikes conducted by India. Follow more election news here. After the terrorist attack in Pulwama, Shah said, Pakistan deployed its troops on the border, expecting another surgical strike, but Modi conducted airtstrikes and destroyed terrorists’ havens. “There were only two countries earlier who would avenge the blood of their soldiers, America and Israel,” he said, adding that Modi has included India’s name in that list. On the political battle this elections, Shah said that on one side under Modi’s leadership and BJP with its allies and on the other side it is the Mahagathbandhan, which has only come together for selfish and corrupt motives, and because they are scared of Modi. “They don’t have any leader, principles or policies,” he said. Under the Congress rule, for 70 years, Shah said that the poor did not feel that “the country was free”. He accused the SP and BSP of selectively helping certain communities . The BJP, he said worked without asking the religion of the various beneficiaries of government schemes. 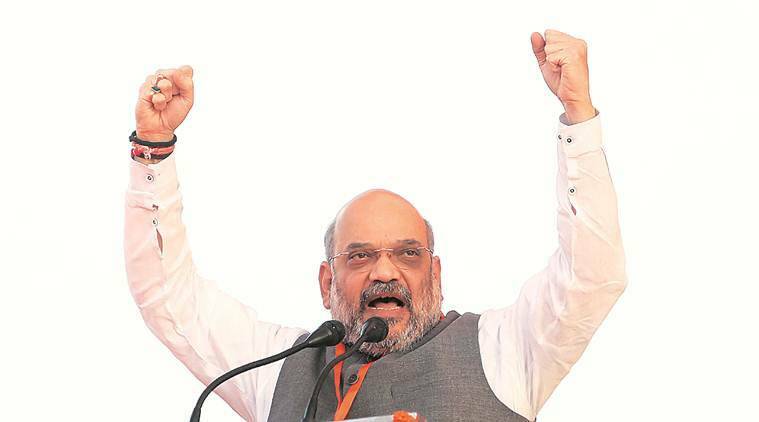 Accusing the Congress, SP and BSP governments of scams worth “Rs 12 lakh crores”, Shah said there has not been any corruption allegations under the BJP’s rule.